When you consider investing in a document management system to create and manage documents, what are some important features to have? Keep different versions of files while maintaining version control. Whenever you are working on a document, you are likely to have more than one version. If you are collaborating on a document with others, it is helpful to maintain different versions so you can review a complete history of all changes and updates to the document. Intranet software with document management capabilities will help you see quicly where a document is in its approval process. Your intranet document management software also needs to be scalable to manage a volume of documents in different statuses (creation, review, approval, archiving and disposal) as well as complex documents that contain imagery. It must also offer you control to manage the relationship between compound documents and components. Versioning also implies retrieval. You have to be able to pull up a document version that you need at any time. Hence, your social intranet document management system has to recognize different document statuses and offer you search capabilities to locate different versions when you need it (on-demand). This process of retrieving and processing documents also has to be easy to do or intuitive to use. Managing your documents also has to be easy to do via a menu interface or a drag and drop interface. Depending upon the nature of your business and documents, you may also require a customized or configurable lifecycle process for your documents so you can tailor the steps from document creation to revision and disposal. With intranet document management, you can also build and modify compound documents such as a Microsoft Word document that contains imagery (JPEG or GIF) or an embedded Excel spreadsheet. You can keep multiple versions of files and manage each aspect individually while maintaining version control for the single document. You can also create, search and browse documents easily through an intuitive web-based interface. Integrate your social intranet document manager with the business applications you use daily. A reliable intranet platform is also secure and integrates seamless with popular business applications so you can share files across mobile and desktop computers easily. It offers seamless integration with desktop and business applications. With an intranet document manager, you can connect directly to popular applications ranging from Internet browsers (Internet Explorer, Safari, Firefox and Chrome) to applications such as Microsoft Office. You can quickly add files to the manager ranging from Word documents to PDF files, imaging files as well as XML-based content. You are able to search and access documents in integrated systems throughout the platform. Administrators have flexibiity in connecting software commands to link to applications as needed. An administrator can also designate user privileges based on need for access and workflow. Enable real-time feedback, comments, and knowledge sharing. One of the most useful aspects of having social intranet document management system is enabling real-time feedback and comments. Commentary is an essential part of collaboration. Online collaboration tools enable an organization to facilitate the spread of in-depth shared knowledge through a common platform. Having an intranet document management system that is social, makes all of the files and documents inside the system social in nature. When you share concepts within a digital collaboration environment, you enable a brainstorming process where new ideas can be shared easily due to individual contributions and the sharing of knowledge in a common space. Social document managers offer both document management as well as knowledge management software within a social context for the user. This enables the individual user to have access to all the information necessary to produce high quality content and facilitates the sharing and access to knowledge expediently. Commenting enables multiple people to collaborate on a document and contribute their knowledge to make the content in the document better. Each file that is uploaded can be commented on, liked, followed, shared easily, rated and discussed within the social document manager. Feedback - You can actively collaborate with members of your team or clients and work on the same document. People can offer feedback in the form of comments to discuss the evolution of a document or to ask questions about the document. Like button - You can offer simple, immediate feedback using a "like" button similar to Facebook where you give a thumbs up that you like a document, or a thumbs down that you don't like the document. Ratings - Ratings enable you to group the best content (all bubbles selected) together so you can search by rating to find the best content. If you are pulling content ideas for future marketing endeavors, it is helpful to know which content is considered the best value within your organization and enlist community support. This feature helps people find the best content when they need it most. Messaging - Intranet chat and messaging enables you to quickly and easily communicate with other users in real time. Messaging works similar to social media platforms like Facebook so users will already be familiar with the 'instant chat' window on the lower right side of the screen. Organize your files in a way that makes sense to how you actually work. Logical folder hierarchy offers you organization on your terms. Through this feature, you can organize files how you work and what makes sense to you and your organization structure. Unllke traditional document management that can easily have a complex filing system and architecture, intranet document management makes it easy for you to organize files based on relevancy for you. You are able to immediately see the context for the content. Social intranet document software offers an intuitive, web-based interface to expand your interactions within the document library, enabling you to search and access for documents faster and more easily. You can organize files within folders and conduct complex searches within folders as needed. See documents before you download. Preview Online is very useful for quickly reviewing and sorting documents before downloading. It allows you to look inside the document and review the contents to make sure that it's the document you need. This feature also saves you a ton of time. Why should you have to take the time to download a document, click on it once its downloaded, then wait for your desktop software to open it? Just preview it online. Bring attention to content that is relevant or needs to be removed. Flagging allows you to bring attention to content, whether it is relevant content or it needs to be removed. Once you flag content, the administrator receives a notification that such content has been posted. It's a way for employees to moderate the content that is being posted, and conviently notify one of the higher-ups if it doesnt meet standards. Upload multiple documents easily via drag and drop, multiple file upload, or file sync. Intranet document management software makes file management easy and simplifies document uploading. You can upload content via drag and drop, a multiple file upload or through file sync. Drag and drop uploads allow people to simply drag files off of their desktop directly into their web browser to upload new files. A multiple file upload allows people to upload many files at one time, rather than just one at a time. This saves time and is an efficient way to upload multiple files simultaneously. File sync allows people to install a small program on their desktop that place is a folder on their desktop that is mapped to the document manager. Instead of having to open up a web browser to upload files, they can simply drag and drop the files into this folder, and behind the scenes, the files will be uploaded to the social intranet document management system. This will also automatically download any new files that others may have uploaded into the mapped folders, keeping everything in sync on the web and on your desktop. 8. Check in and check out. Check files in and out as you edit them like an online library user. This feature allows people to check out files when they are adding or editing a document. Once they are finished, they can upload the file again, which creates a new version, and then checks the file back in. The check-out tool available in several social document managers facilitates editing of files without confusing the user through multipled edited versions. For example, when a user wants to make changes to a file, they can check out the file like an online library user. When the person has finished using the file, they can upload it back into the manager as a newer version. The manager maintains an archive that allows people to see all the versions uploaded and refer to older versions whenever needed. This enables quick revision and editing without compromising quality. Tag files for discovery, easy categorization and future content creation. This feature allows people to associate keywords or tags as meta data. This can be very helpful in discovery and searching for the files you need. It also may help you assemble new content with sufficient background information. Remove unnecessary files and restore if needed. When documents are deleted, instead of them being completely removed from the system, they are placed in the recycle bin. You can restore files in case they were accidentally deleted. Great post ! Now a days document management system is very essential for big as well as SME’s also. Every organization has data and document which requires good handling and management. Using the latest Document Management System and office automation is very helpful and advantageous. It removes the unnecessary spaces and keeps the document safe and secure. 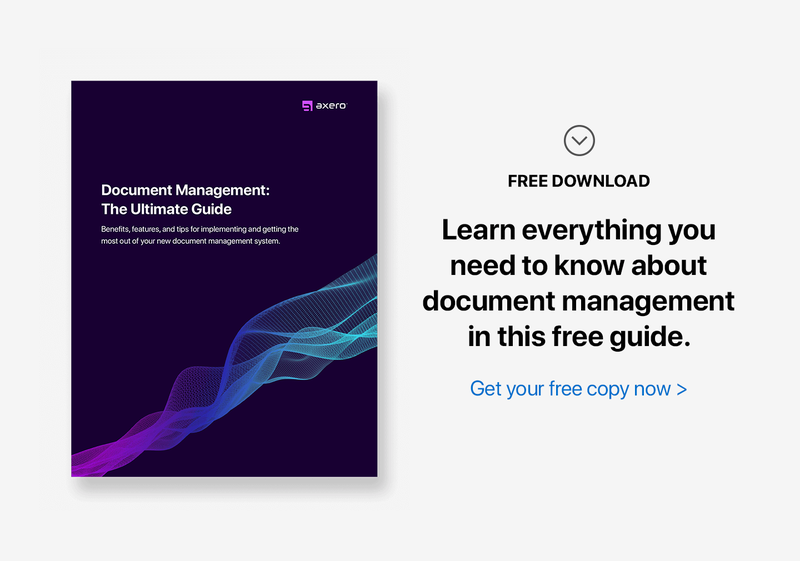 Great write on document management as it is become very crucial for managing all the data securely and having easy to access with great open source option. As we use some of the great features to manage our document nowadays it would create a great impact on our entire system and make it more useful for humankind. data Security is the toughest job nowadays, so proper DMS can help us with this.